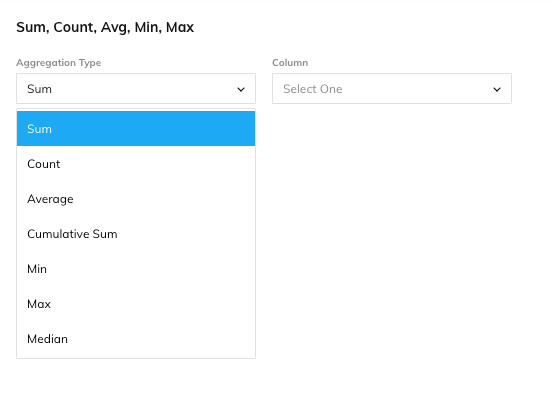 Using the Sum, Count, Avg, Min, Max button will add another column where you can see the sum, count, average, cumulative sum (or the running total of the rows), minimum value, maximum value, or median value for one of the columns you choose. Click on "Add Transform," then select Sum, Count, Avg, Min, Max. This will bring up a window where you can add some sort of aggregation to a column. First, choose your aggregation. Once you've done that, you will see another field where you can choose what column to apply that to. If you'd like to add multiple columns with various aggregations, just press the blue "Add Aggregation" text and repeat the steps above.